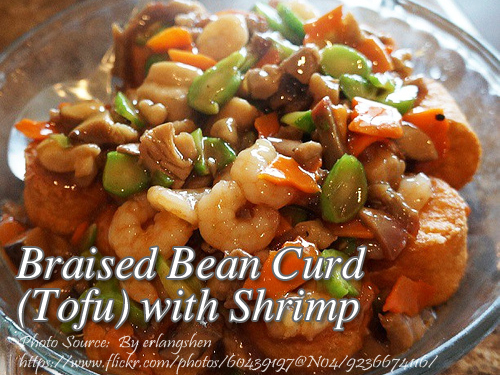 A very simple braised bean curd or tofu dish with shrimp. Actually if you will read the ingredients, it looks like it has an Asian influence particularly the Chinese cuisine. It’s because tofu or bean curd is present in many Chinese dishes. Tofu and tokwa has similarities because they are both made from soy bean curd. But the difference is tofu is a lot softer and silky compared to tokwa which is firm and harder. You won’t make a mistake buying the wrong bean curd because they are sold in different shapes. Tofu is larger and sold like a brick whereas tokwa is shaped into smaller squares. Using the term tokwa and tofu is confusing because they are almost the same when they are translated in English. But I think tofu is borrowed from the Japanese word while tokwa (tau-kwa) is from the Chinese. Drain off liquid in tofu by wrapping it in a cheesecloth and pressing out water or put it between 2 paper napkins and press out the water. Just double the napkins on top and at the bottom. Divide each tofu blocks into 8 pieces. Mix flour, eggs, and ½ tsp. salt to make a batter. Heat half of the oil. Dip tofu in batter and fry until light brown. Drain and set aside. Heat about 3 Tbsp. oil and saute leaks and shrimp. Add tofu, then broth, 1 tsp. salt and the white wine. Mix cornstarch and water in a cup, then slowly pour into the rest of the ingredients until the sauce thickens.